Heroism does not grow old. 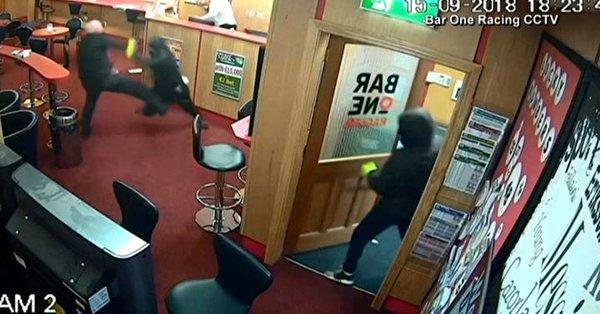 An 85-year-old grandfather in Ireland foiled a robbery attempt at a sports betting office over the weekend with his bravery and strength, turning him into an internet sensation in the process. Surveillance video from the shop captured Denis O’ Connor’s incredible feat on Saturday. It all started when three hooded guys carrying a shotgun and hammers entered the shop and demanded money from the cashier. Too bad for the three bad guys, grandpa O’ Connor was there to save the day. Video shows one of the hooded men jumping into the counter while his two other cohorts were preoccupied with intimidating the customers inside. O’ Connor stepped forward to tackle the men. The grandfather brushed past one of the suspects, seemingly unconcerned that the suspect was pointing the shotgun at him. The strong elderly man then started wresting with another suspect had positioned himself behind the bar. The two men at the counter started to threaten the manager, demanding he give them the money from the safe. The gun-wielding suspect then moves off-camera, while O’Connor boldly makes his way towards the other two robbers, engaging one of them in a fight. One of the hammer-wielding suspects in a gray hoodie quickly runs away but playing hero to the hilt, O’Connor runs after him. A second camera shows the shop’s manager, Tim Murphy, struggling with another suspect who was also holding a hammer. One of the suspects whom O’ Connor fought him quickly made his way out. A second suspect also tried to leave the shop, but not before training his gun on the old man. O’ Connor refused to blink and instead, he picked up a bar stool as his own weapon, then later dropping it to continue pursuing the two suspects out of the shop. The other hammer-wielding suspect was forced away from the counter before O’ Connor helped the manager tackle the remaining bad guy. O ‘Connor managed to stop him for a while by tripping him. One of the other suspects came back to get his accomplice out of the shop, but not before fierce grandfather managed to give the hammer-wielding suspect another kick. In the end, all three suspects left the shop and the area quickly, unable to face the formidable grandfather. The local police are now hunting the suspects, and asking people for their help in case they managed to get videos of the bad guys’ get away vehicle. The manager was quick to heap praises on O’ Connor for his heroic efforts, saying he owes the grandfather a debt of gratitude. Local authorities also acknowledged the extra ordinary efforts of the grandfather, although they were also quick in cautioning the public about the inherent dangers of pulling off such acts- no matter how heroic- when faced with armed criminals. As for the brave grandfather who saved the day, it was back to his daily routine of playing golf. He has declined to grant interviews.